Pemakö (Tib. པདྨ་བཀོད་, Wyl. pad+ma bkod) or 'Lotus Array' is perhaps the most famous of all the hidden lands (Tib. སྦས་ཡུལ་, béyül, Wyl. sbas yul), which according to prophecies, are to be revealed or 'opened' by tertöns throughout the Himalayan region. 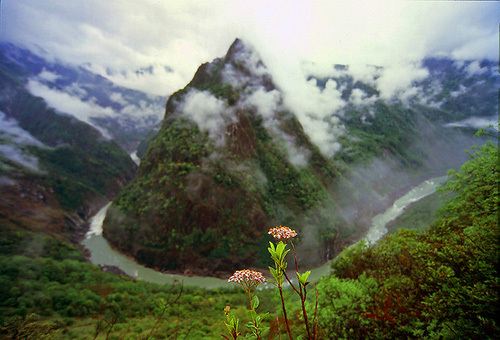 It is located in southeastern Tibet, where the Brahmaputra river descends into India. In the year I turned fifty-nine , at night on the first day of the first spring month, a red woman appeared, so gorgeous one could gaze at her forever and never be satisfied. Saying she was a lotus dakini of the west, she approached me and said, “I’ve come from Palace of Lotus Light in the west. I neither go nor stay. I appear as the dynamic expression of your sublime insight, as are all the dakinis of any land who have appeared to you and given you prophecies. As for me, the reason I’ve come here is this—in the past a monk named Délek, Goodness, made corrupt aspirations: with their momentum, the barbarian dogma is going to surge here like an ocean. People will go insane from poisoned water. Lapses of memory, accidents, and the five poisons will blaze like fire. Will be rife with bandits and thieves craving action. Virtuous conduct will be gradually overshadowed. Many people and horses will be stabbed to death. A range of undetermined diseases will spread. The arrogant demigods will cause harms as demons. Make haste—go swiftly to that place. She sang this, then vanished. ↑ 'Lotus light' is the what is translated in ‘A Clear Mirror’, but it should be equivalent to 'Palace of Lotus Light'. This page was last edited on 5 February 2019, at 20:46.